This guide is for managing or adding products once you have already created a shop and have gone through the Shop Setup Wizard. If you haven’t yet created your shop and gone through the wizard, then please refer to the Creating a Shop: Adding Products Individually Guide. 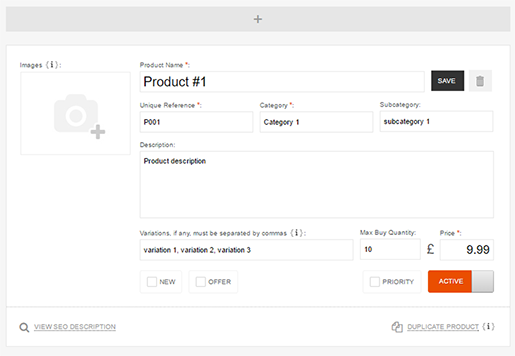 If you need to add a few more products, it may be quicker to add these individually; you can also make amendments to your current product list – using the simple interface. The first thing that you need to do is open the Shop Manager. To do this, from the Main Menu, select Shop Manager from under the Pages & Content header. Step 1: The first page that you will be brought to is the Product List; press the Add Product button. 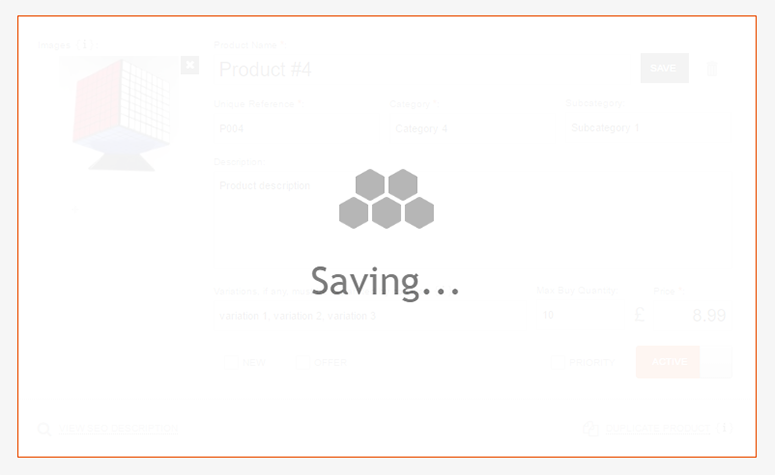 Step 2: This will bring up the product information form – which will be outlined in orange. The compulsory fields are marked with an orange asterisk (*). You are probably familiar with the product field by now, but for further information, please take a look at the Product Field Explanations List. Step 3: To add an image, press the Add Product Image icon; you can select an existing image from your Media Library, or you can choose to Browse Computer to find and select an image. Step 4: Once you are happy with the information added, press Save. To add another product press the Add a Product button and repeat the process. 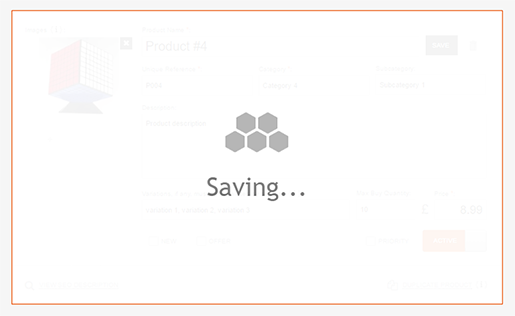 After adding multiple products, press the Save All button. It’s a good idea to export your product list regularly for a back up, especially after adding more products. 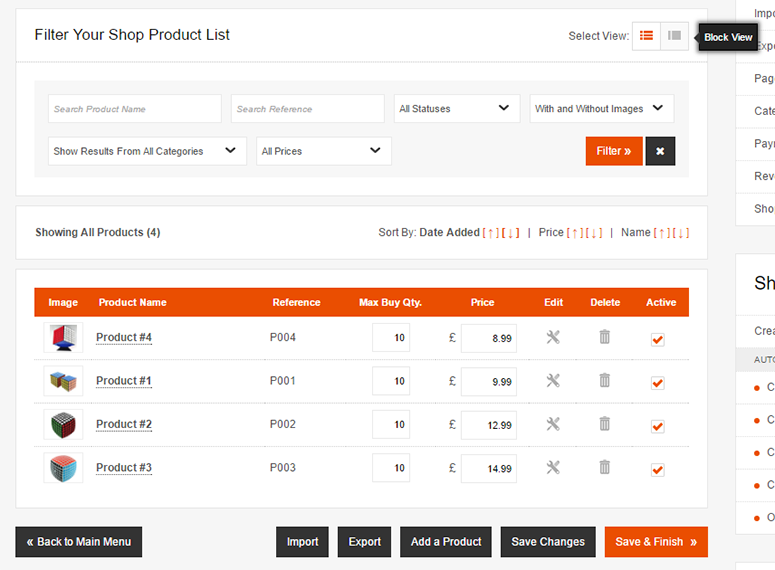 To export your list press the Export button; then Export Product List .CSV on the next page. 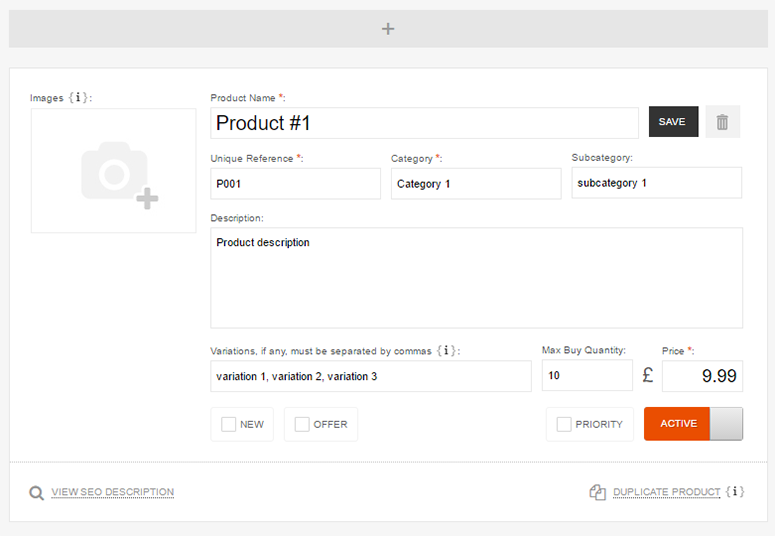 Product Information Form: You can easily edit any of the fields in the product information form. For example you can check the New, Offer, Priority & Available boxes quickly and easily. For more information on the fields, take a look at the Product Field Explanations List. Remember to press Save if you make any changes. Images: To add an image, press the Add Product Image icon; you can select an existing image from your Media Library, or you can choose to Browse Computer to find and select an image. You can remove an image by simply pressing the X in the corner of the image box. 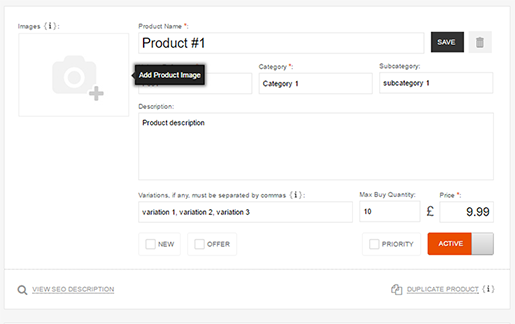 You can also change the image, by clicking on the image and pressing the View/Change Product Image button. Delete Products: You can delete your products by pressing the Delete Product icon – you will then be asked to confirm. 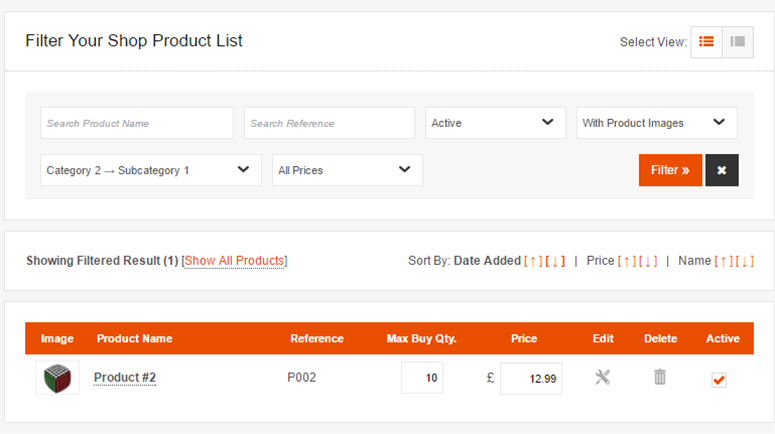 Sort By: If you have a large product list, you can sort your products by Date Added, Price or Name (this is not reflected on your site). Select View: You can choose whether to have a Block View or Compact View. 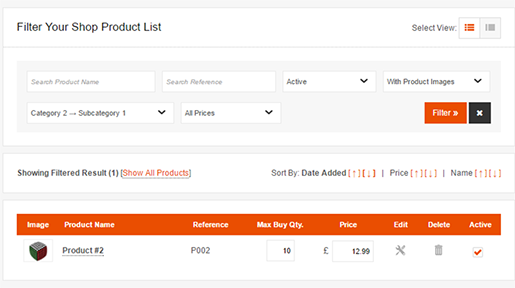 The Compact View allows you to have more products listed per page – again this will not be reflected on your site. Filter Your Shop Product List: You can search by Product Name or Reference. You can also filter by Status, Categories or Price Range. This is especially useful if you have a large product list – and you need to quickly find an item of selection of products that need editing. After making any changes – we would recommend exporting your product list as a back up. To export your list, press the Export button, then the Export Product List .CSV on the next page.